The beginning of the second quarter of the 16th century marks the emergence of the representation of “Lotto” knotted carpets in Portuguese painting. These carpets, their name derived from the Venetian artist Lorenzo Lotto, who represented them in his paintings, are characterised by their geometrical, angular aesthetics lined up in a repetitive scheme. The Lotto carpets of Turkish origin probably reached the high-end Portuguese market through the Venetian export trade. The presence of these carpets in Portuguese interiors is mostly evidenced through representations in paintings, in particular those of the court painter Gregório Lopes (active 1513‒† 1550). In this representation of the Annunciation, the Virgin Mary stands on a Turkish carpet with a yellow, meandering arabesque pattern on a red field and a pseudo-kufic border. 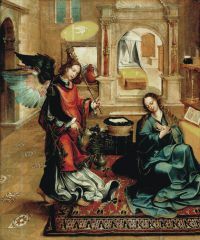 It’s relevance in the painting is reinforced by the artist, for he captures the very moment when the Archangel, as if suspended in time, places one foot on the carpet, and thus enters the sacred domain of the Virgin Mother. As such, the carpet is used as a device in the painter’s masterful depiction to mark the passage from one space to another, as though through a gateway. Interestingly, the opposing end of the same carpet is represented in another of Gregorio Lopes’s paintings, the Presentation of the Head of Saint John the Baptist, of around 1539 to 1541, a painting encompassing a ceremonial banquet in an aristocratic setting. 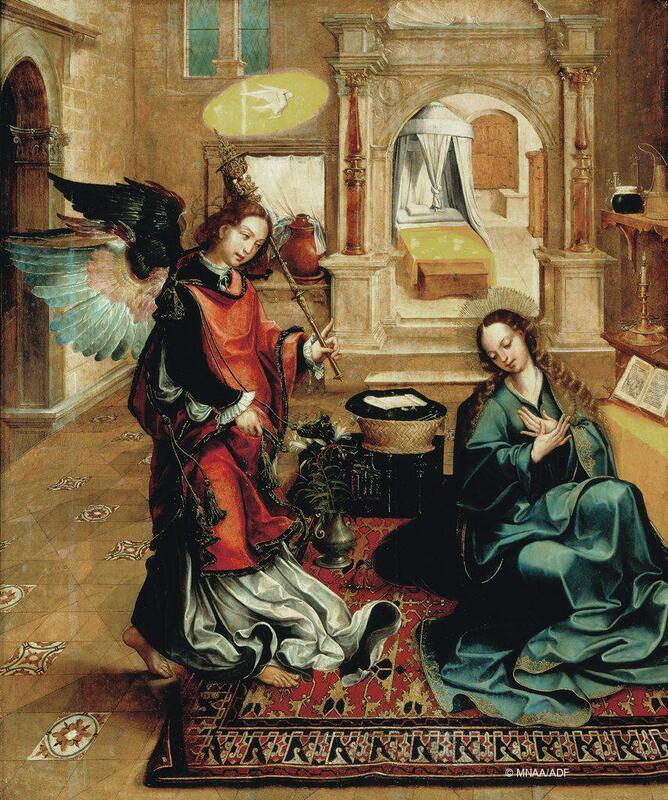 In the Annunciation the artist takes the contrary approach, emptying the space of the splendour of the banquet, and replacing pageantry with a bare, peaceful interior befitting of the unfolding scene.